It's not surprising that basil is known as king of the herbs. 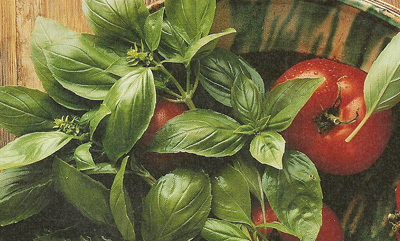 Its complex flavor and refreshing aroma have made sweet basil a favorite in cuisines from around the world. 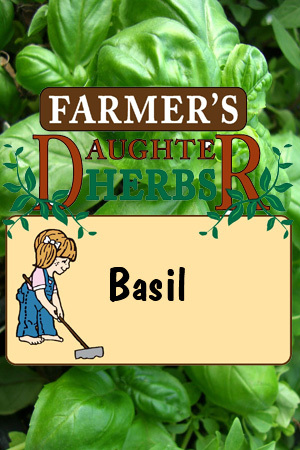 Basil's name is believed to come from the Greek word "basilikon," which means royal or king. With its many varieties this easy-to-grow herb can enhance anyone's garden. Sweet basil is an annual herb that is grown both for ornamental purpose as well as for cooking Basil is a member of the mint family This family is identified by its hairy square-shaped stems. Ocimum basilicum, or sweet basil, is one of over 40 varieties. Basil grows to about 2 1/2 feet in height and is equally wide. The leaf colors can be various shades of green which is sometimes mixed with purple and yellow. White or purple flowers bloom during summer months. Basil is the primary ingredient in pesto sauce and lends itself well to other Italian dishes such as tomato sauces, pizza, soups and even desserts. Basil is a distinctive ingredient in much of southeast Asian cuisine, especially Thai cooking. Basil tea is said to relieve stomach aches and improve digestion. Sweet basil leaves are steeped in oil to add flavor and are used in jellies, vinegars and sorbets. The sweet basil plant itself provides ornamental enhancement to gardens with colors ranging from light green to dark purple. Freezing is the best way of preserving basil, but it may be dried as well. Drying or dehydrating basil works ok, but it will eventually loose its flavor after a few months. For either process of preserving, pick the leaves from the stems, rinse, and pat dry. Dry at around 100 degrees. (do not over dry or you will loose all oil/flavor from the basil). If you use oven to dry, make sure to leave oven door ajar, so the temperature does not get too high. Put in an air-tight container, and store in a dark location. 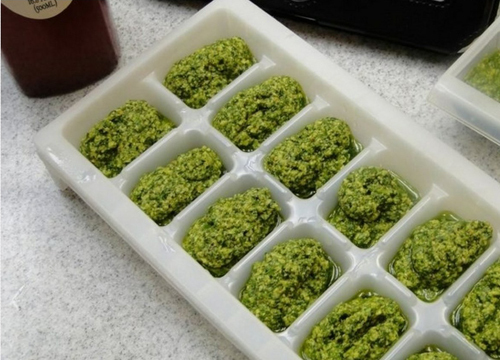 To freeze the leaves, pure'e them in a blender or food processor.Place the basil pure'e in an ice cube tray and add a little water to cover and freeze. Basil will last several months in freezer. Basil leaves can also be mixed with salt in a blender to make basil salt.